Experienced sunburn, it is uncomfortable. Then how to get rid of it? Everyone knows that applying lots of sunscreen, and be in shady places is the best way to avoid sunburn. Scientists have also recently discovered a protein in the body that triggers pain from sunburn. But what should we do if the sunburn is already happening? According to dermatologist, taking pain relievers such as ibuprofen and aspirin is one way to relieve pain caused by sunburn. But there are also a number of options natural remedy to help overcome them. In pharmacies or other drug stores, you can find aloe vera gel to relieve pain from sunburn due to the antioxidant content and anti-inflammation. While these drugs can alleviate, most scientific evidence does not show that aloe vera can speed healing sunburn, says Dr. Jonette Keri, MD, professor of dermatology at the University of Miami Miller School of Medicine. "But it feels good and makes skin feel cool," added Keri. Although that sounds weird, but shaving cream often appeared as a reliever sunburn which can be found in the house (although technically, this cream does not contain natural ingredients). Although there is no scientific evidence that states that shaving cream can relieve sunburn, but that does not mean shaving cream useless, says Keri. "Shaving cream contains menthol and other chemicals that are naturally able to cool and make the skin feel good." That's because menthol is a compound that evaporates very fast and can take the heat caused sunburn was vaporized with it, said Jessica Krant, MD, clinical assistant professor of dermatology at SUNY Downstate Medical Center, New York City and founder of the Art of Dermatology practice. Some natural health website recommends applying vitamin E oil on exposed skin sunburn so that pain is gone and help moisturize the skin. Many scientists agree that vitamin E and C are able to work as a means of preventing the occurrence of burns caused by sunburn, experts said. That's because both vitamins act as antioxidants to heal burns affecting oxidative damage to skin cells. Vinegar (especially apple cider vinegar) is one of the most famous sunburn relief that can be obtained at home. But is vinegar can really work? There has never been a study studied the effects of vinegar on a sunburn, but these materials tend to be effective because vinegar is an antiseptic and can help cool the skin as it evaporates. Theoretically, vinegar can help balance the body's pH levels by eliminating the stinging sensation caused by sunburn, although it works just a cold sensation on the skin. Logically, if you are stung by the sun then you have to put something cold on the pain. The experts also agreed that a cold shower to help cool the skin and make you feel better. Naturally, the ice cubes are also part of the cooling tactics, but be careful when applying ice on the burn as this can cause increasingly severe heat sensation by creating an "ice burn" or a burning sensation from the sting of ice. Although there is no research to support it, many people are turning to use baking soda to get rid of sunburn. It makes sense. Baking soda creates an alkaline environment can soothe the skin as well as an antiseptic and can help relieve itching from it. Dr. Fitzgerald also recommends mixing baking soda with water, then use a cotton ball to rub it on the affected sunburn or add a half cup of baking soda to the water to take a bath and soak. A glass of cold milk certainly refreshing, but some health sites indicated that the cold milk that is applied to sunburn may help relieve the pain. Milk is known to help relieve the pain, itching and burning when used in the form of cold compresses, Yogurt also seem to have the same effect. But there has been no scientific studies to support this. Honey is often as a reliever various types of disease, including pain caused by sunburn. Honey is antibacterial and indeed some studies have shown that honey can help heal wounds, says Keri. Because of this, applying honey to wounds caused by sunburn can help skin cells regenerate new skin epithelium. Experts also recommend using manuka honey in special because of its antibacterial and anti-inflammatory. Maybe this sounds crazy, but some people claim that the tomato rubbed on the wounds of sunburn can help ease the pain. Although scientific proof is insufficient, but tomatoes can cure sunburn, but tomatoes can be useful to prevent injuries. However, a study in Germany showed that the smear of tomato paste to the skin to help prevent sunburn. This is probably because tomatoes are rich in a chemical called lycopene that can help reduce injury from ultraviolet radiation on sunburn. 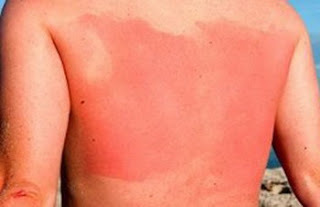 Put oatmeal in sunburn injury is one of the oldest home-style treatment, and it also seems to be supported by scientific evidence. Malt extract has been shown to have anti-inflammatory properties that can help reduce pain caused by sunburn. If you already know how to cope with skin sunburn, do not forget to also take precautions by using a high SPF sunblock. For outdoor activities choose sunblock with an SPF 50 that applied 2-3 hours to keep skin protected.